My two greatest loves are painting and embroidery and I am always looking for ways to bring them together. I had so much fun experimenting with watercolor paint, fabric paint, embroidery and appliqué that I thought I would share my experience and hopefully inspire you to do a little experimenting of your own. I started by finding a reference picture that I wanted to duplicate onto a piece of fabric. Above is a rose photo I used as my reference. I got a piece of plain white cotton fabric and used a mechanical pencil to sketch the rose outline into the fabric. An easy shortcut is to tape your picture to a bright window using remove-able tape then tape the fabric centered over the picture and trace the outline. You can use whatever inexpensive little watercolor palette you may have at home. I found that if you do not wet the fabric first, the paint just kind of sits on top of the fabric in a clump but if you wet the fabric by running a water dipped paintbrush over the area to be painted, the paints spreads and bleeds in a loose fashion like watercolor on paper. It does tend to bleed a quite a bit. I like the way the pencil remains part of the painting, giving it structure. I started using a hairdryer on low speed to dry my painting. The paint lightens considerably since it is absorbing into the fabric so I continued to add more color until I was satisfied with the brightness. Once I was satisfied with the painting, I placed my fabric in a hoop. To add some stability, I added another piece of white cotton fabric underneath the painted fabric and sandwiched both of the pieces of fabric into a wooden embroidery hoop. I embroidered over the pencil lines. I loved this effect of a very loose watercolor on fabric. In my mind, I was thinking a black rose with colored embroidery on top would be kind of cool. I printed my reference picture in black and white and used my watercolor paint to start shading. It was fun to be able to play with the white watercolor paint on top of the black since I rarely use white watercolor paint. I forgot all about using colored embroidery thread and instead used black, white and gray embroidery thread to create this look, which kind of mimics a graphite pencil drawing. I still want to try another black and white painting with color embroidery but I haven’t gotten to that yet. Once I completed the watercolor rose in both color and black and white, I was wondering what I could do with them (besides hang them on the wall) and thought they would look great sewn onto clothing. I realized that the watercolor paint would wash right out so I decided to do one more rose but this time using permanent fabric paint. Fabric paint can be watered down in the palette then applied to the dry fabric. 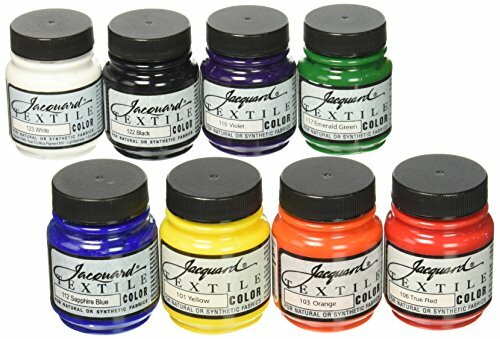 It is much easier to control and blend without the bleed of the watercolor paint so you get a much tighter look. The paint sits on top of the fabric so the pigments are a little brighter and the paint covers the pencil marks more which is fine since the structure is more intact without the bleed of the paint. I really LOVED the quality of this paint so much. I watered it down quite a bit and it still retained it’s pigment. I have no affiliation with this paint but I ordered some online based on all the reviews and was SO pleased I wanted to share it. It was completely odorless, too. It is a lot messier than I am used to (wear your playclothes:). A little goes a long way. I am totally in love with these! Two totally different looks but I like them both! I embroidered some simple highlights and then decided I wanted to appliqué this rose onto a pair of jeans. What I like about this method is that it makes it really easy to embroider vs stitching right onto the jeans and having to reach your arm up into the jeans. To attach the rose to the jeans I cut around the rose leaving a small 1/4 -1/8 inch lip of fabric around the edge. Place the rose and press onto the desired surface. I sewed around the edges with variegated thread and added some straight stitches. I love the result! I will definitely be experimenting more with this combo! Thanks, kindly , for stopping by. I hope you get a chance to do some experimenting of your own! It is so satisfying!